The 35th Regiment of Foot, Grenadier Company, is the primary apparatus of the Royal Sussex Society. Established in 2002, the 35th Regiment of Foot is a proud member of the British Brigade, the main Revolutionary War reenactment umbrella organization in the United States. The 35th Regiment portrays the regiment as it was in the 1776 New York campaign and is active primarily within a three hour radius of New York City. The grenadiers were the hand-picked heavy infantry and saw extensive action, the historical details of which can be found on the other pages of this site. The regiment keeps an active schedule and participates in battle reenactments as well as living history displays. The 35th is a close-knit, versatile unit which seeks to promote historical sites and further education about the American Revolution and the experience of the British soldier. The grenadier company was one of two "flank" companies, so named because they paraded on the right of the regiment. Their most distinguishing characteristic was the 12-inch bearskin hat, but they also sported cloth "wings" on their shoulders and brass match cases which carried slow-match for lighting grenades. Typical British soldiers who wore cocked hats were part of the "Battalion Companies"--standard line infantry. It was from their ranks that the best were selected to become grenadiers. The flank companies were always kept up to strength, replacing casualties as they could, to the detriment of battalion company officers who saw their best men taken away to the more prestigious--and dangerous--grenadiers or light infantry. Grenadiers usually had at least a year of experience and grenadier officers had two years of experience from the battalion companies. While each battalion company had a captain, a lieutenant, and an ensign (the most junior commissioned officer), grenadier companies had one captain and two lieutenants. The grenadier companies were also authorized to have fifers in addition to their drummers, again adding to the prestige of the company. Grenades themselves were seldom used in the latter half of the 18th Century, seeing most service on board ships or employed during sieges against fortifications. Grenadiers derived their name from this in the 17th Century. As heavy infantry, grenadiers were clothed with cloth shoulder wings on their uniforms and bearskin caps to make them appear larger and more intimidating. The grenadier companies lead their regiments on parade and were kept up to strength where battalion companies might be considerably reduced in numbers. As shock troops, grenadiers also suffered higher casualty rates. To maximize their heavy-hitting power, grenadiers from various regiments were frequently banded together to form composite grenadier battalions, becoming a very potent shock force to unseat the most stubborn foe. The 35th's Grenadier Company was formed into the 1st Battalion of Grenadiers in Boston of 1775 and took part in the Battle of Bunker Hill along with the 35th's Light Infantry company. General William Howe withdrew from Boston in March, 1776, and landed at Halifax. 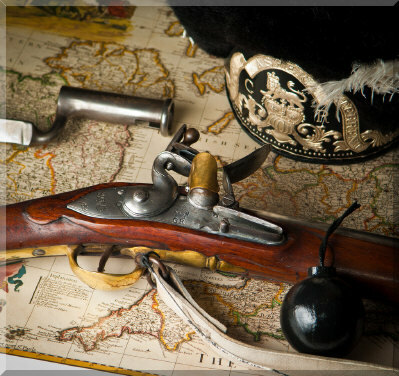 There it was ordered that the grenadiers should all be issued with Long Land Pattern Muskets (also known as 1st Model Brown Bess) which were slightly longer than the new Short Land (2nd Model). They fought throughout in the New York Campaign. Though the 35th's battalion companies also operated against Pelham Manor, White Plains, and Ft. Washington, the grenadiers and lights left their parent regiment behind in New York to participate in Howe's Philadelphia campaign. Following the evacuation of Philadelphia, the army withdrew across New Jersey, culminating at the Battle of Monmouth. At Monmouth the grenadier company, lead by Captain Hugh Massey, was exhausted by the unrelenting heat, bayonet charges, and deadly fire of the American enemy. Being the cream of the army, the Grenadier Battalion was thrown against the colonists very early on in the battle and incurred significant casualties--more from heat than from the enemy! In 1778, the entire 35th was sent to the West Indies as part of General James Grant's 5,000 man expeditionary force. Massey's grenadier company fought at the Vigo and helped secure the reduction of St. Lucia from the French. Indeed, so eager were the 35th's grenadier for the fray that Capt. Massey was once reprimanded for too enthusiastically engaging the enemy on his own initiative!